The winning designer will receive $3,000 and be invited to an unveiling of the final medal in Washington D.C. The National Endowment for the Humanities is seeking a new design for the National Humanities Medal, which is bestowed annually by the President of the United States in a White House ceremony. The National Humanities Medal, inaugurated in 1997, honors individuals or groups who have made outstanding contributions to the humanities. Past winners have included authors such as Toni Morrison; historians such as Stephen Ambrose; filmmakers such as Steven Spielberg, and Nobel laureates such as Elie Wiesel. It is a distinguished group of thinkers who deserve a glorious medal. A full list of past medal recipients is available here: http://www.neh.gov/about/awards/national-humanities-medals. The new medal is intended to premiere at the 2013 National Humanities Medal ceremony and will serve the Endowment far into the future. 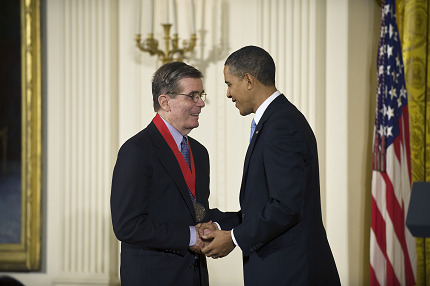 NEH invites thoughtful and creative solutions for a new National Humanities Medal. Translating the idea of the humanities—the study of literature, philosophy, history, and other subjects—into a visual form is a challenging task. (For more about the humanities, visit the NEH website, www.neh.gov.) The design should reflect the importance of the award and of the humanities in a graceful, insightful, and ultimately beautiful manner. a blank area on the back of the medal of at least 3 by 1.5 inches. The name of the medalist will be engraved here. The medal hangs on a ribbon around the neck. The diameter of the medal should be between 3 to 4 inches. The design can use realistic or abstract elements to convey the idea of the humanities. Designs should indicate relief depths, if possible, and make suggestions for type of metal, materials, patinas, and/or colors to be used. Submissions are only being accepted via Challenge.gov. Please read the official rules carefully to determine eligibility and to understand licensing agreements. You may submit more than one entry if you have developed more than one unique medal design. Upload an image file of your design. It can be in the form of a scan of a drawing, a digital drawing, or a digital photograph of a sculpted model. The maximum file size allowed is 10 MB. Acceptable file types are: PDF, Zip, and Word. In the description summary area, provide a brief statement about the thought process behind the design and how it relates to the humanities. A draft design can be saved and edited before it is officially submitted. Click "Submit for Review" to have your design entered in the competition. Questions? Please contact medalcontest@neh.gov or 202-606-8446. A panel of distinguished judges have been selected for their expertise in the fields of art, sculpture, and minting. They will advise the Chairman of NEH, who will choose the final winning design. The subjects and ideas of the humanities—literature, history, philosophy, and others—need to be conveyed in the design of the medal. This may be done through realistic or abstract design. Ultimately, the design needs to be translated into a 3-dimensional medal. A winning design, which may be 2-dimensional, will have to be adapted by an artisan in order to create a sculpture for the medal. Can this design become a bas-relief medal? Between 10 and 12 medals need to be struck each year to present to National Humanities Medalists. Can this design be replicated successfully, without excessive cost, for many years to come? Is the design graceful, elegant, and to be cherished by its recipient? Is it worthy of a Presidential medal?